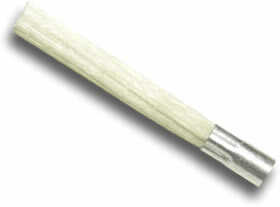 A soft, broad pencil eraser made from synthetic rubber. 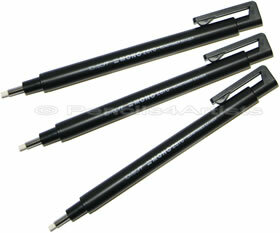 Ergonomically shaped making it easy to hold and great for finer erasing. 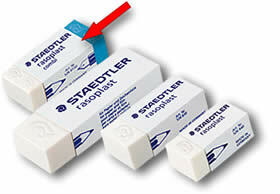 An ergonomically designed, top quality eraser which is PVC free. 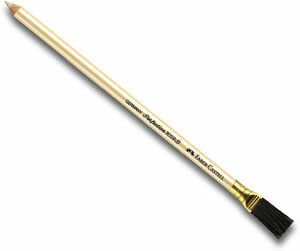 Avoid contact with dirty or oily hands and your picture with this dusting brush from Faber Castell. 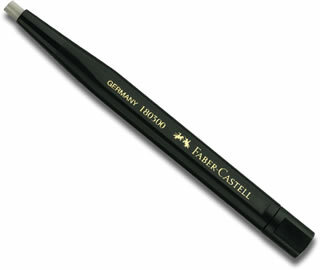 The Faber Castell Glass Eraser pen has a fibre glass nib which is excellent for removing drawing ink from transparencies and even rust spots on items around the home or on the car! 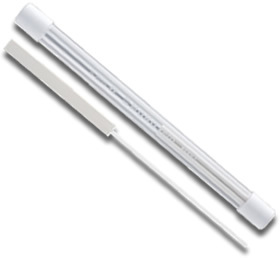 This great plastic holder with an eraser in is perfect for accurate erasing. 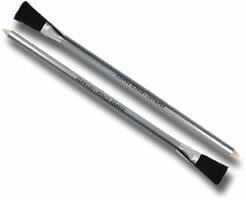 Simply lengthen or shorten with the sliding mechanism. Comes with an eraser and refills are available. 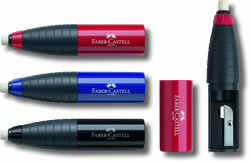 A handy retractable eraser which is pen shaped and refillable. 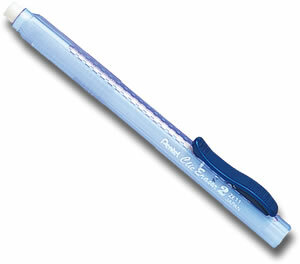 Lifts pencil cleanly from the page. Designed to be held like a pencil so you can erase with ease and accuracy. Perfect for right or left handed artists. Comes complete with 8 refills. 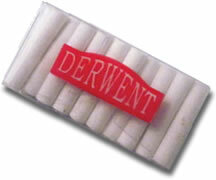 Pack of 30 refills for the Derwent battery eraser. 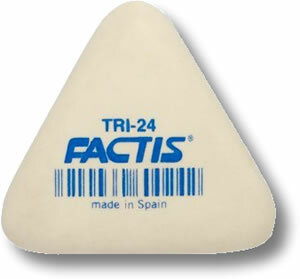 Even more accuracy in your erasing! 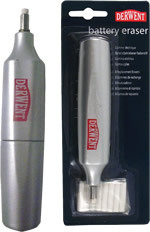 Made from flexible, polished stainless steel this brilliant shield has various different shapes to help you get that erasing just right. 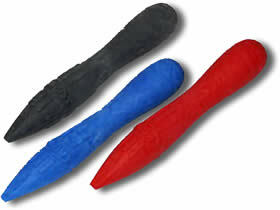 A top quality ergonomic, easy to grip eraser that does not smear. 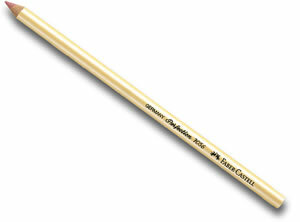 A pencil shaped eraser which is really comfortable to hold. 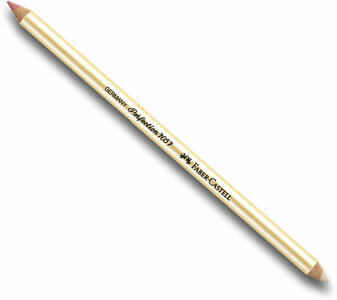 It sits nicely in the hand with the ergonomic grip zone and has a pointed end for fine erasing and a round end for broader erasing. 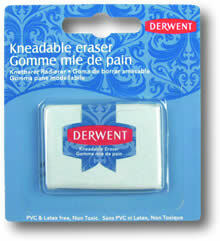 A kneadable putty eraser perfect for all art and sketching. 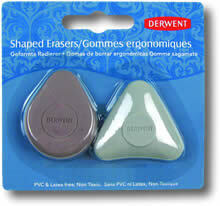 Soft, mouldable erasers from Derwent. 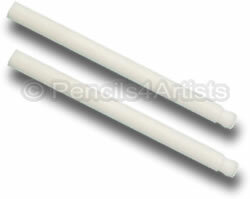 Use a small piece shaped to suit your needs and dab onto areas of your drawing to lift out pencil gently and accurately. 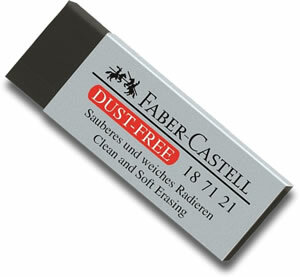 The Faber Castell Art Eraser is a a soft, kneadable eraser which can be worked into a point for detailed correction. 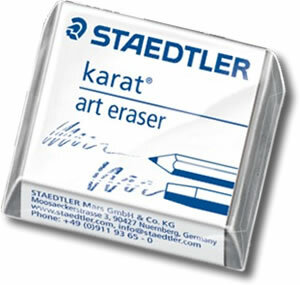 The eraser can be used to lighten pencil, charcoal and pastel compositions by gently lifting shading and more detailed work. 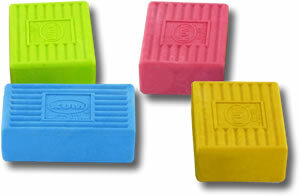 The eraser comes in an extremely handy hard plastic box to keep it soft and clean. A good little general purpose eraser. 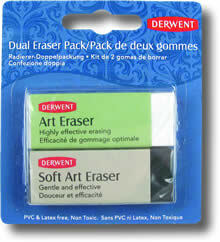 Derwent's soft art eraser contains charcoal for gentle and effective erasing, thus causing less damage to the paper. 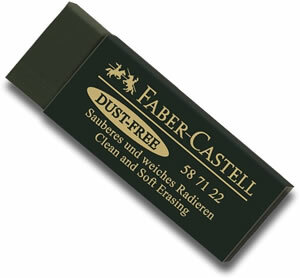 This is a great eraser for graphite and charcoal pencils. 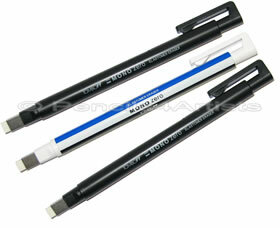 The harder white eraser is ideal for all standard erasing. 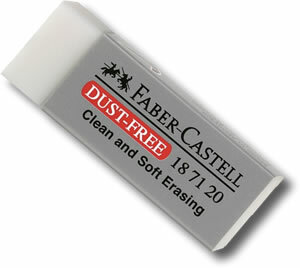 Clean, dust free erasing with this neat little eraser. 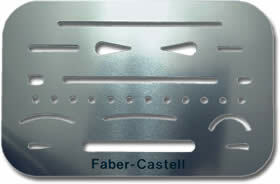 Measures 60 x 20 x 10mm. This eraser is dark green in colour. 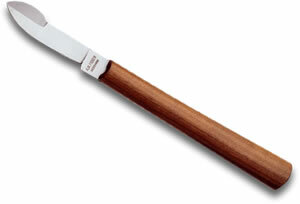 The Kum Correc Brick is a high quality eraser which leaves no smear marks. 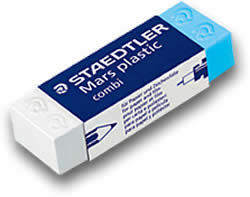 A double ended eraser with the brilliant Mars Plastic Eraser for graphite at one end and a Mars Plastic eraser for ink at the other. 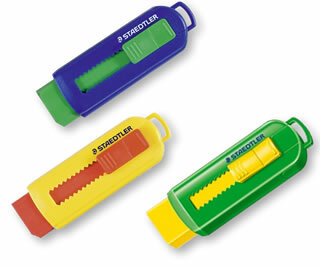 PVC and Latex free erasers in lovely bright colours. 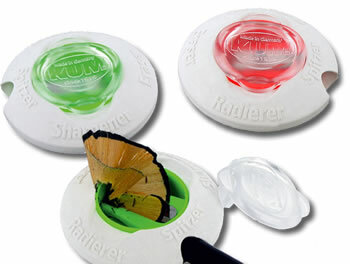 These erasers are retractable and have minimal crumbling. 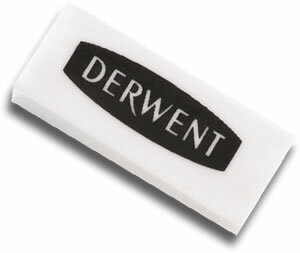 The Derwent Shaped Erasers Pack contains two firm erasers in two different shapes to provide as many different points and curved surfaces as possible, for comfortable and accurate erasing. 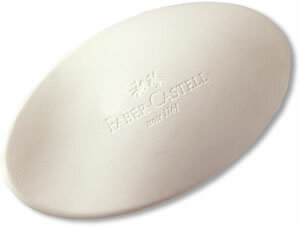 A plastic eraser for clean, non smudging erasing. 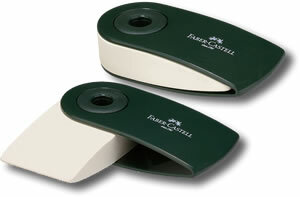 It's ergonomic shape makes it comfortable to use and the wedge shape allows for precise control. 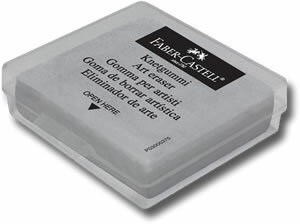 A plastic sleeve protects the eraser from dust. 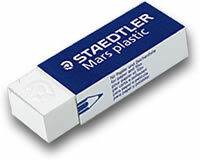 Mars Rasor is a latex free eraser in the shape of a pencil for ballpoint pen, writing and drawing inks with a brush on the other end. 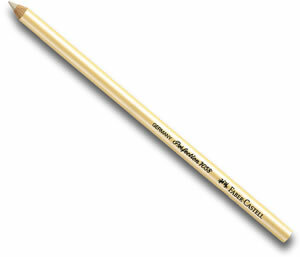 Faber Castell Perfection Eraser Pencils are perfect for fine detail erasing and sharpen like ordinary pencils. 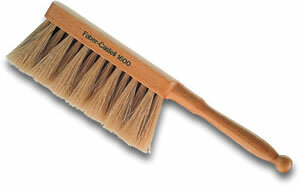 With a handy brush at the other end. 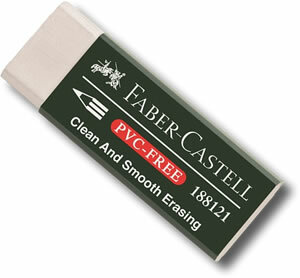 Faber Castell Perfection Eraser Pencils are perfect for fine detail erasing and sharpen like ordinary pencils.